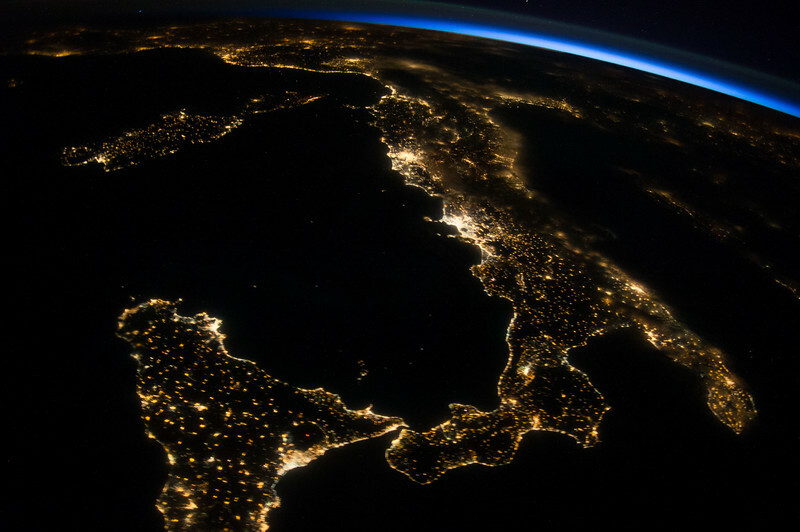 Maynard Art Show: With this amazing photo, the astronauts captured the grand drama of Italy at night! The boot shape is well defined by the lights along the coast. The two brightest areas on the west (left) coast are Naples (closer) and Rome. To the left of the toe is the island of Sicily. If you look carefully along its southern coast, just above the lights of Catania, you’ll see a roughly circular dark region, with a glowing red in the center. That’s lava from Mt. Etna, an active volcano! It takes a very steady hand to get night lights, with 1/3 second exposure. This is the best of a series they took that night, though it still does have some motion blur. On the horizon you can see just a hint of approaching sunrise.